That's right. Right on this here blog. 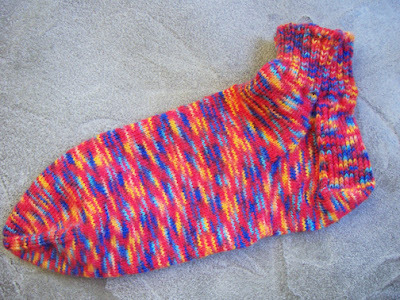 A sock. Finished but missing its mate, poor lonely thing. But never fear, I have all sorts of ideas from Sheri on how to use it should it go mateless for life. This is a real consideration, since it is for my husband, who wears size 13 and likes his socks knit on US 0s. At least it's a cycling sock, which means it's nice and short! Wow, a totally cool one! And I'm so sure you'll be getting its matey done in no time! Love the short bursts of colours. Cute! Does he have clothes to match?! Oh no- the dreaded SSS! The colors are pretty. Cast on the second one and you'll be done before you know it. Size 13? You must really love him. The professor wears a size 14 EEEE shoe. I have never made him a pair of socks. I salute you for your incredible dedication. It ain't happenin' here any time soon! Hey one down one to go!! I just finished my first pair! Yay!!! Nice colors! Eeek - size 13 socks on size 0s (shuddering!) You're a good wife! Size 13 foot on size 0 needles? Now that's love. But you gotta love a man who will wear such colorful socks! Good luck on #2. He better realize how lucky he is. I don't think that sock will be lonely for long! It's too cool to be alone! I love socks on 0s as much as the next person...but for a size 13 foot!? Wow. Love the sock! And size THIRTEEN?!? My husband is only a ten but I haven't tried socks for him yet. Battle on, intrepid knitter!